Summary: LearnItalianPod isn’t a good resource. There are some fun supplementary lessons but the basic learning paths are insufficient in all sorts of ways for someone who’s trying to learn Italian. It’s a very limited tool. It can help you drill some phrases and useful expressions but you won’t learn to create your own sentences and speak. New structures and grammar units appear only in examples. There are virtually no explanations or rules. Apart from repetitions, there’s no practice. The tool isn’t expensive but it isn’t worth the cost. The website is easy to use and has a pretty design with colors of the Italian flag. Additional lessons contain some really useful vocabulary and facts about Italy. I really disliked the recorded lessons. The hosts speak excessively slow, especially at the beginner level and the repetitions are tedious to listen to. There are almost no explanations of grammar concepts. It’s confusing and discouraging. Very limited practice is provided. The tool doesn’t remember your level so you have to choose your language path every time you log in. The order of content is not well thought through. Price: LearnItalianPod has only one subscription plan. Their VIP membership can be purchased on a monthly basis at $14.95 per month or for the whole year at $149.50. 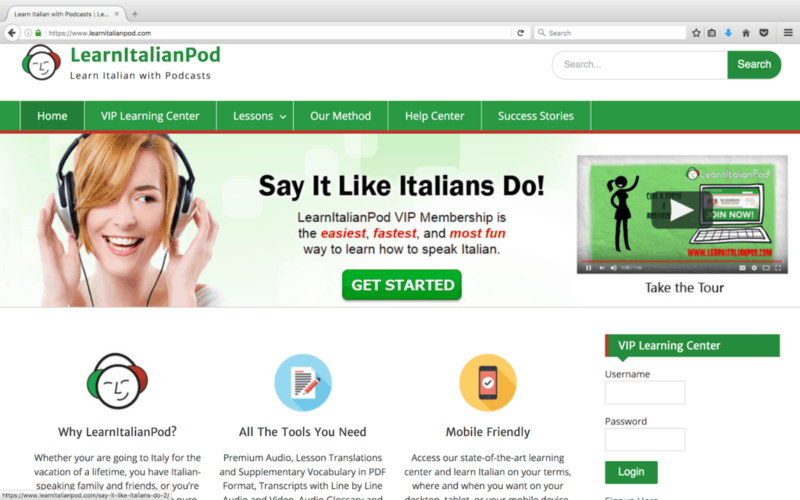 ItalianPod101 or News in Slow Italian would be a much better choice for someone looking for a podcast-style lesson. Rocket Italian and Pimsleur are well structured and comprehensive courses. 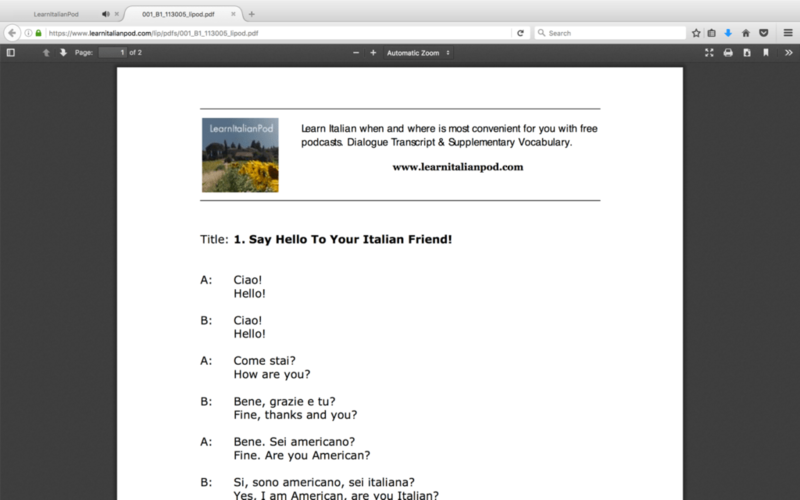 Ripeti Con Me is a fairly simple Italian course that will get you speaking right away. 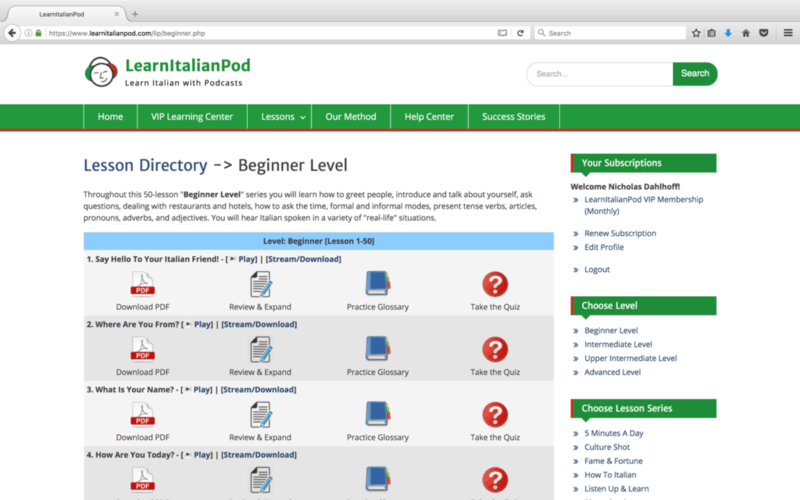 After my previous experience with a podcast based tool, ItalianPod101, I was immediately suspicious of LearnItalianPod. My worry was that there would be almost no grammar and exercises aimed at language production. The tool is even less thorough than I expected. It’s not entirely meritless but it fails to teach more than just the very basics on its own. 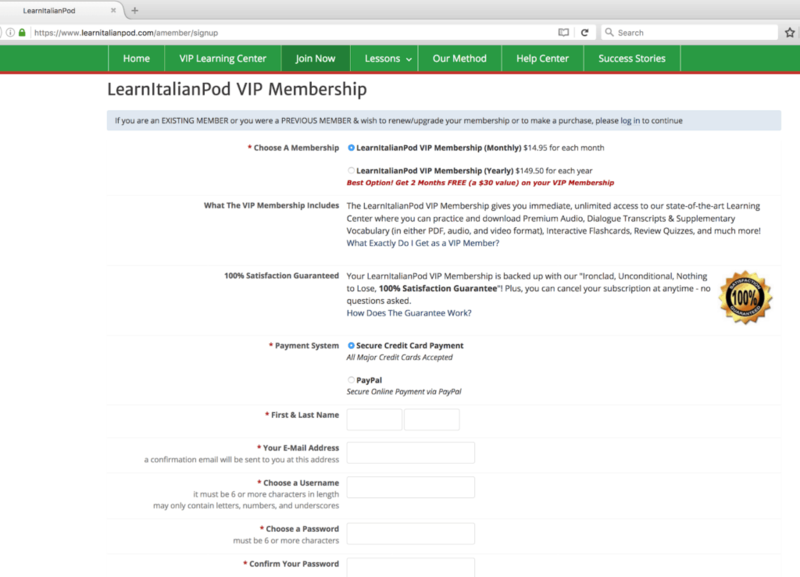 I could see LearnItalianPod working for someone interested in just having a taste of Italian before a trip to Italy. An intermediate or upper intermediate student could learn some useful expressions and find out more about the Italian culture while exploring additional resources. 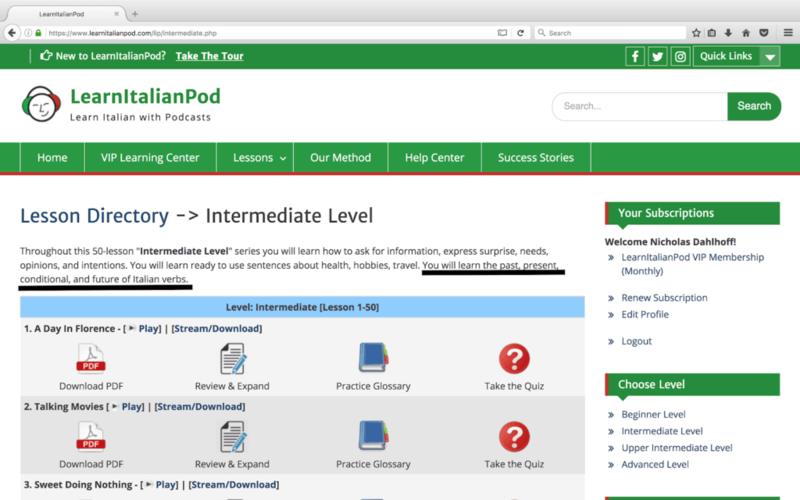 However, LearnItalianPod can’t work as a primary tool for learning Italian. It lacks the structure and thoroughness to justify the cost. Rocket Italian, News in Slow Italian, or Pimsleur would all provide a better pathway for learning Italian. LearnItalianPod groups lessons into level-driven learning paths and additional resources. The available levels are: Beginner with 50 lessons, Intermediate with 50 lessons, Upper Intermediate with 30 lessons and Advanced with 12 lessons. There are plenty of additional resources, full of various lessons aiming at teaching you specific things about the language and the Italian culture. The idea behind the podcast-based lessons is to teach you the language by making you listen to lesson recordings and drill words and phrases. LearnItalianPod doesn’t offer a free trial. To use it you need to sign up for a paid VIP membership and log in to your account. To start learning after you’ve logged in, you have to go to the VIP Learning Center. There you can either choose your level or a lesson series from the additional resources catalog. The program doesn’t remember your level so you have to repeat this process every time you log in. To me this is tedious but perhaps some self-learners will appreciate the flexibility that comes with it. After choosing your level you’re redirected to a lesson directory, where you can pick a lesson. Here, the tool also doesn’t track your progress or remember your choices. This means that you have to remember yourself, which lessons you’ve already completed and which ones you should work on next. A typical lesson contains a lesson recording with the options of listening to it, a downloadable PDF, a review and expand section, a practice glossary and a quiz. At the beginning of each lesson, you should listen to the recording. When a lesson recording is played you can pause it but not rewind it so it’s better to use the streaming option. You can download just one recording or get a zip file with all of them under Premium Audio Download. 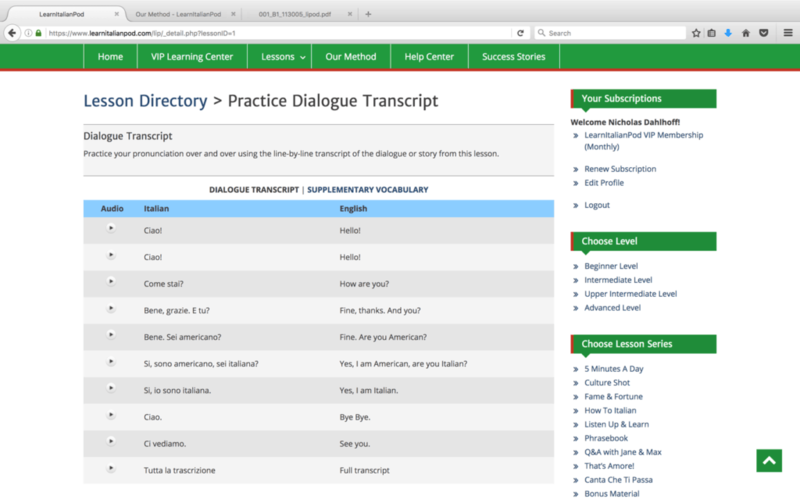 Each lesson recording includes an introductory conversation in English or Italian (depending on your level), a dialogue and line-by-line translations. There are many repetitions during the recording, which are clearly aimed at drilling. You can hear the same words and expressions as many as three times. Given that you’re also supposed to listen to partial recordings in other parts of the lesson, it seems unnecessary. Fortunately, they don’t transcribe the lesson banter between the hosts. This way the downloadable PDF contains only the most important information from the lesson. The review and expand section provides you with the dialogue’s transcript. The line by line translations with recordings allow you to practice your pronunciation and learn vocabulary from the dialogue as well as the supplementary vocabulary, which is provided in the downloadable PDF. 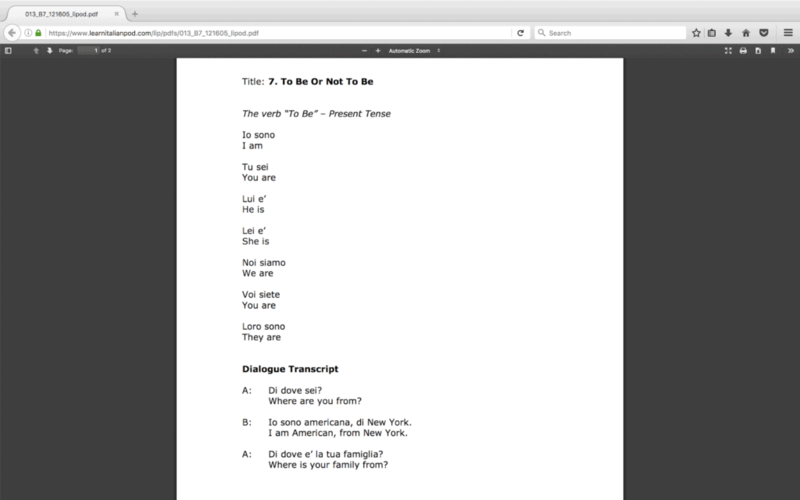 You also have the option of listening to the whole dialogue under Tutta la trascrizione/Full transcript. In the following section, the practice glossary, you’ll find some of the expressions used in the dialogue with translations and audio. It’s honestly just a limited repetition of what you can find in the review and expand section of the dialogue. The last part of the lesson is a quiz, which is, unfortunately, the only way to practice what you’ve learned inside LearnItalianPod. 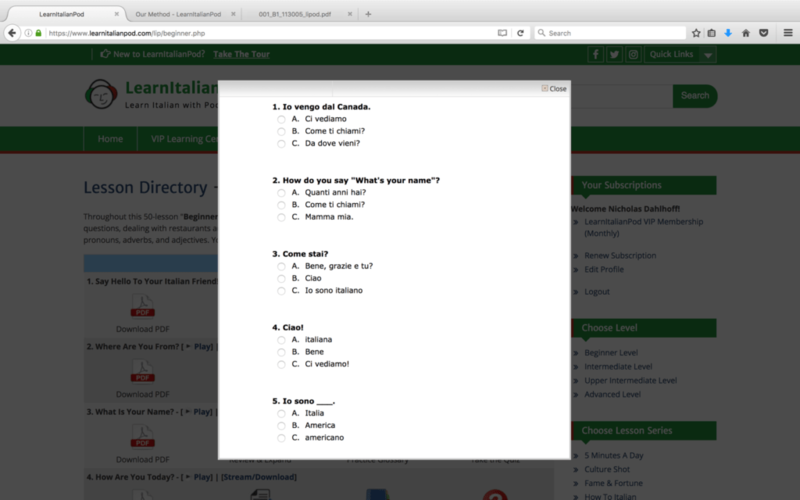 Each quiz is a multiple choice test with a mixture of tasks prompting you to translate phrases from English to Italian and match Italian expressions with the provided choices. It checks your knowledge from both the lesson and its expansions to a limited extent. It certainly doesn’t feel like enough practice. A lot of vocabulary from LearnItalianPod is useful and the tool does a good job at teaching it. The drilling of phrases and words could help someone enough to allow them to have a simple conversation. The additional lessons of the course include useful expressions, facts about Italy and some slang. They could benefit an intermediate or upper-intermediate student as a secondary resource. Unfortunately, LearnItalianPod is too limited to actually teach you the language. What’s more what it teaches you is sometimes weird. There are numerous curious choices by the authors which suggest that the resource wasn’t well thought through. One of the strangest ones, is their decision about personal pronouns. English doesn’t conjugate verbs. It’s “I speak”, “you speak”, “we speak” etc with the exception of “he/she/it speaks”. In Italian, the form of the verb differs depending on the subject of the sentence. For instance, the verb “parlare” would take the form “parlo” for the pronoun “Io” (“I”) and the form “parliamo” for the pronoun “Noi” (“We”). Since the form of the verb changes and thus implies the subject, there’s no need to use personal pronouns. No one without a good reason, such as emphasis, says “Io parlo inglese” (I speak English) but rather “Parlo inglese”. Some people believe that it’s easier to initially learn the forms of the verbs with the pronouns and it’s not uncommon to see both the pronoun and the verb in resources for absolute beginners. Unlike LearnItalianPod such resources are consistent. They use the pronouns for a short time (2-3 initial lessons) and when they decide that a student is ready, they drop them entirely. LearnItalianPod uses personal pronouns for more than half of the beginner course. 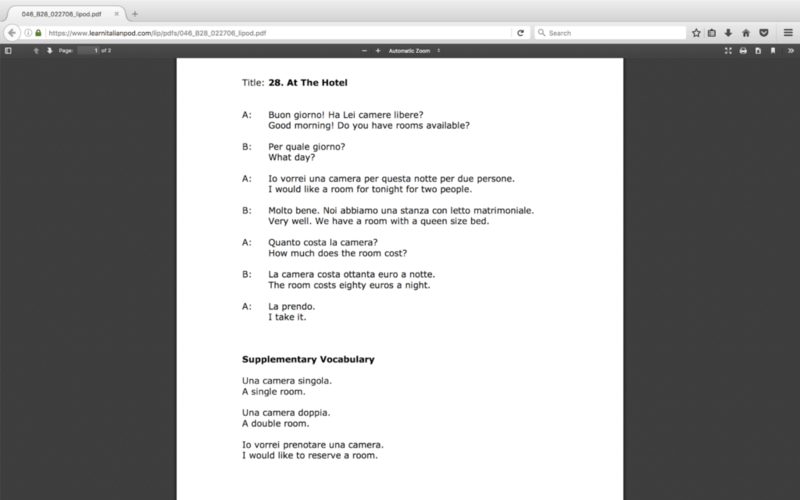 For instance, in lesson 28 there’s a complex dialogue regarding a hotel reservation still with the pronouns present. Given that no one talks (or writes) like this, it’s just harmful to develop a habit in someone that they will necessarily have to unlearn at a later stage. It’s confusing and honestly doesn’t seem to make much sense. This is just one of the examples of the LearnitalianPod’s faults. LearnItalianPod is largely missing grammar explanations and exercises. It introduces new tenses and constructions as examples and there are only minimal grammar explanations in the recorded lesson. It makes learning really difficult, for beginners in particular. Contrary to the widely held belief, Italian isn’t a simple language. Between friendly native speakers and limited vocabulary needed for a simple conversation, you can get the impression that speaking Italian is easy. However, the basics aren’t enough to communicate effectively and you need to know quite a bit of grammar if you want to progress. Let’s just take verbs as an example of the complexity of this language and the limited value of LearnItalianPod. As I mentioned before, Italian conjugates verbs depending on the subject. This means 6 different forms of each verb for each person (I, you, he/she/it, we, you, they). On top of that, verbs are grouped into three categories depending on their regular conjugation patterns. There are also many exceptions and irregular verbs. In short, it’s a lot to process and learn. You do need plenty of practice that LearnItalianPod doesn’t give you. Unfortunately, it doesn’t even give you the theory. Only conjugations of the most important (and often irregular) verbs, such as “to be”, are provided in the lessons. For other verbs, you only learn one form that appears in the dialogue. In other words, you can end up being able to say “He works” but not knowing how to say “I work”. This problem, at least with the present tense, can be handled easily. You can find the forms and conjugation patterns in a traditional resource such as a print dictionary or in an online resource (ie italian-verbs.com or wordreference.com). Unfortunately, your difficulties will just keep growing as you go. According to the introduction to the intermediate level you’re supposed to learn about past, conditional and future Italian tenses. How can anyone do it with no explanations, only with a few sentences as examples? I really have no idea what the authors had in mind. Italian has many tenses and each of them requires different forms, yet again depending on the subject. Just in the past, there are three main tenses: passato prossimo, imperfetto and trapassato prossimo. Roughly, passato prossimo is a past tense, similar to Past Simple (i.e. I went) in English, imperfetto is an equivalent of Past Continuous (i.e. I was doing) and trapassato prossimo of Past Perfect (i.e. I had eaten). Now, as a speaker of English you know (perhaps subconsciously) the rules of using tenses. In Italian, you need to learn everything from scratch because it has different rules than your native language. For instance, passato prossimo can be used as both Past Simple (“I drunk”) and Present Perfect (“I have been drinking”). To have one tense express both concepts is counter-intuitive for you. This is why to remember it, you need to learn the rule and then drill it with exercises till it seems natural for you. LearnItalianPod entirely disregards that. In lesson 1 of the intermediate level “passato prossimo” is introduced and the lesson recording mentions briefly that it can be used as both Past Simple and Present Perfect. It’s also mentioned that passato prossimo is a compound tense and it requires two verbs to form a sentence. This is the first time ever you hear about such a tense and it isn’t elaborated on any further or repeated anywhere. How to make a sentence in the tense? What two verbs can be used to form sentences? What’s the difference between them? There’s no answer to such basic questions. All you get in the Downloadable PDF section is a dialogue with the past tense used and a few additional sentences in the past tense with translations. You’re supposed to guess everything else. You obviously shouldn’t have to figure out grammar rules yourself (Comparison of Italian grammar books). This isn’t why you pay for a language tool. What is even more surprising is that LearnItalianPod introduces an exception first. The first helping verb applicable in most cases, “avere”, isn’t discussed in this lesson. 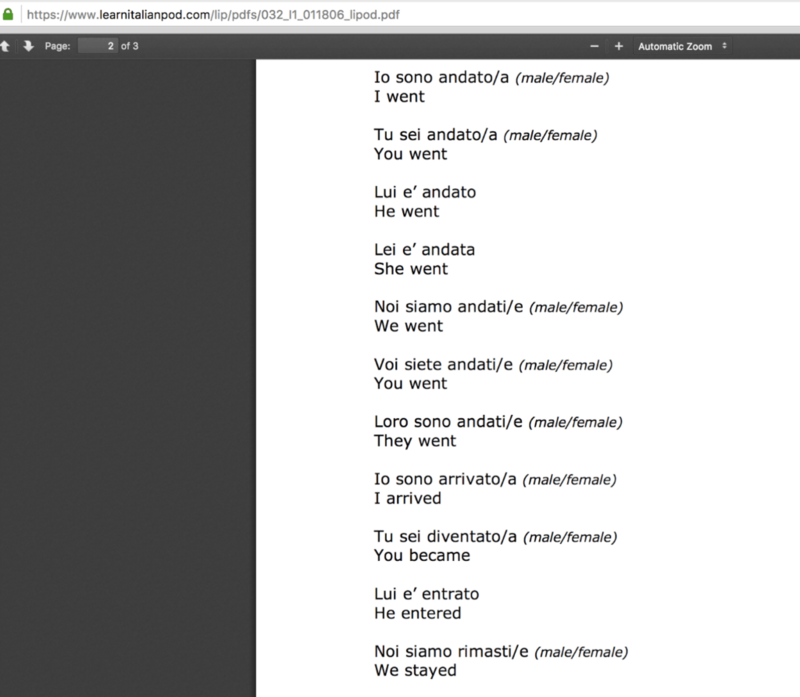 Instead, LearnItalianPod gives you examples with another one, which is used rarely, “essere”. It isn’t only less common but also requires learning additional rules of usage regarding gender and number (which of course are not provided). I have never seen any resource teaching it in this order. You don’t want to overburden a student like this. You start with what’s usually true and you get to exceptions later – these are basics of foreign language teaching. Such lack of consideration makes LearnItalianPod an impossible tool to use to learn anything about grammar and language production. On a positive note, there are additional resources outside of the lessons chosen for your level, which are quite interesting. There’s a cool series aimed at practicing Italian for a few minutes a day, which allows you to quickly learn something interesting. Thanks to these lessons you can, for example, learn expressions of love and affection in Italian. You also have the option of learning with flashcard sets. What’s more, there’s a culture shot series, which provides you with a number of lessons teaching you about Italy and Italian culture. Other useful resources are how to lessons, a phrasebook, listening comprehension recordings with great gap filling exercises or a news experience in Italian. 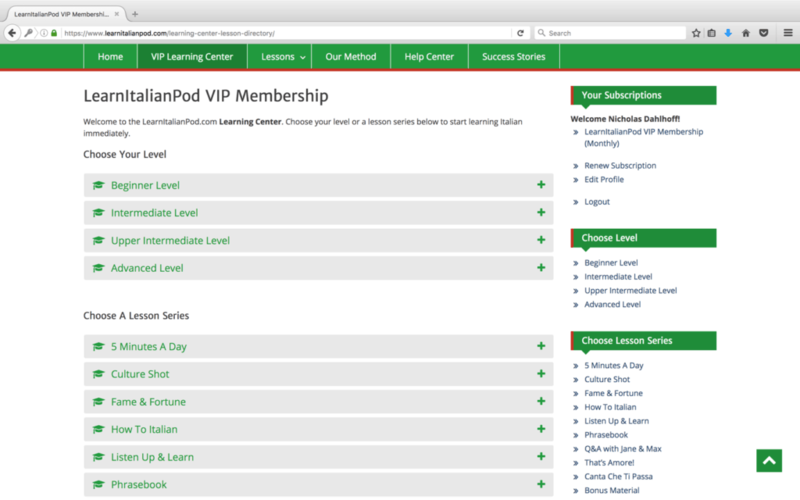 LearnItalianPod has one kind of subscription, VIP membership. You can choose a monthly subscription at $14.95 per month and cancel it at any time. You can also save an equivalent of two months of subscription by buying a whole year of the service for $149.50. It’s not a bad price for access to a whole language platform but in this case, it’s a waste of money. The additional resources are fun to use but the core level-driven series is limited and not well thought through. I’m very disappointed with LearnItalianPod. It seems like it was prepared without a proper plan. I think it could be very frustrating for a beginner to use. Perhaps a self-determined intermediate student would have more luck but there’s no point in buying LearnItalianPod if you’re looking for a comprehensive resource. The only part of the program that is actually educational and entertaining are the additional resources. Students looking to expand their vocabulary could benefit from getting a subscription for a month and exploring this section.